Millennium Hotel Rotorua is perfectly situated next to mystical Lake Rotorua and the Polynesian Spa and offers rooms with views over Lake Rotorua, the city or the hotel's garden courtyard. 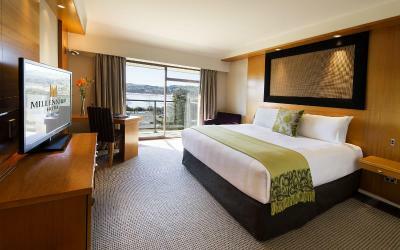 Located on the garden edge of Rotorua's Arawa Racecourse, Rydges features panoramic views across the city, to Lake Rotorua and Mokoia Island. There is a heated and covered roof-top pool and fitness centre. Guests enjoy access to free Wi-Fi. Holiday Inn Rotorua is a modern hotel overlooking the Whakarewarewa Thermal Reserve and Historical Village. It features free parking and free use of the heated swimming pool and fitness centre. Up to 2 children under 12 eat and stay free. Winner of both the TripAdvisor Travelers' Choice Award 2015, RotoVegas Motel is just 400 metres from Rotorua city centre. It features a heated outdoor swimming pool and a sauna. Many studios and apartments include a private heated spa pool. Featuring free Wi-Fi, an outdoor thermally heated swimming pool, and rooms with private spa pools, Sport of Kings Motel is just 10 minutes' walk from Te Puia Thermal Reserve. Executive On Fenton features spacious, modern accommodation with free WiFi. Accommodation boasts either a 2-person spa bath or a private courtyard with a 4-person spa pool. Just 5 minutes’ drive from the heart of Rotorua, ASURE Palm Court Motor Inn offers self-contained accommodation with a spa pool. Guests enjoy BBQ facilities and 1GB free WiFi daily.